The Philips 190S5FS has surprisingly good picture quality but first, the bad news. As you'd expect in such a cutthroat market, you have to cut a few corners if you want to be cheaper than everybody else. As such, the Philips has no built-in speakers and no height adjustment, swivel or pivot on the base - just the basic tilt facility. 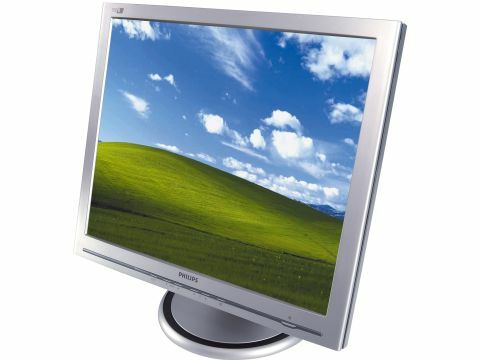 All of these you can probably live without anyway, but the other glaring omission is that the 190S5FS is one of only two monitors in the class to have only a single, analogue video input and no DVI digital video port. That makes future-proofing, or the lack of it, a more pressing issue, especially with graphics cards going digital in a big way. The quality of the finish is pretty good on the panel itself, although the circular base unit looks and feels a bit plasticky, especially with the silver paint job on our test sample. Moving on to the picture quality, the Philips is remarkably good. The auto-tune feature provides a razorsharp display and there's a wealth of colour temperature options to choose from, including 6500K, 9300K, sRGB, 'original panel' colour and a customisable user-defined setting. Crucially, the colour is accurate, especially at the important 6500K and sRGB settings for image editing.